I did some research about the mods being available out there, and this is what I discovered. I hope it might be helpful for starting a constuctive discussion. [Obvious cheat category - according to WG]. 3. Mods that do provide a gameplay advantage, one that we think is bad overall for the game. These are classified as a cheat and are illegal going forward. Extended 6th sense sound duration, e.g. prolonged to 10 seconds. Effect mods: changing how explosions look like, removing smoke, etc. Mods that reveal players' additional equipment. Indicators pointing in the direction of currently spotted enemy tanks outside of actual field of view (ie. not shown on the player screen), with names and distance. This is only legal if there's only one arrow pointing to the nearest enemy tank. This colour red text is reserved for Wg staff only. Edited by Stig_Stigma, 05 December 2016 - 03:29 PM. Someone Suggested to me that Translocation Mod puts a sphere on the exact position of an enemy vehicle when he shoots despite him being unspotted. Red text is reserved for forum mods, an alternative colour would better suit you if you want to keep the thread alive. Target/Enemy Direction Indicators its safe. I ask the WG Support and they tell me there is no ban for it because it only show the same think you can see on Minimap. //Edit: I miss that "Somethink was hit" mod on WG's Ban list. This cant be legit. Edited by Xeideo, 10 November 2016 - 04:16 PM. are u an official representive of wg?? there is no list of forbidden mods yet u have made up a list . Edited by Stig_Stigma, 10 November 2016 - 09:18 PM. nope, but you got off lightly. Do you mean the damage received indicators added in the last patch or mods which show the direction a tank's turret is facing on the minimap? The second has never been part of the vanilla client and I'd interested to know more. He was trying to help you. Check your original post and you'll see that it's been edited by a moderator. People have received forum suspensions for posting bright red text - it's reserved for moderators so that it's clear when a mod has edited a post. Yes, I am training to be sports presenter so that I may one day wake up as David Icke and then become son of dog. I see a few issues with your list. 1. Zoom out mods are quite clearly banned, as extending the zoom out distance allows you to see behind objects that you would otherwise be unable to see behind, so should be in red. 2. Fog removal, haven't found anything from an official WG source for it, so it's clearly your opinion, you should indicate that with the appropriate color from your color scheme, ie yellow not red. 3. Tank skins with hit zones / White Death skins, banned as far as I know and have been for a while on US and SEA servers I believe, so should be in red. 4. Live player stats, perfectly fine, there is nothing in the Fair Play Policy to even remotely imply that part of XVM is banned, so should be in green. Ah, thank you. Assuming these only show when a tank is spotted, I can understand Support's response. IMO any advantage they confer over glancing at the minimap would be negated by having so much neon clutter in the HUD. FWIW, googling the phrase you suggest gives the mod I was querying as the second result, where turret direction is shown on the minimap, hence my confusion. Edit because my next post. Edited by Strappster, 11 November 2016 - 06:55 PM. remove any mods you think might give an advantage. Do this before 9.17 arrives to get used to doing without them. When 9.17 arrives we may well have much more information maybe even a list of we have banned the following mods. That is something they will not want to do before they act. Edited by Gremlin182, 11 November 2016 - 06:48 PM. I'm guessing Support didn't look up the mod, same as I didn't before posting the previous. The enemy indicators are colour-coded, description below is taken from the mod download page, which I won't link for obvious reasons but if you've been paying attention, you'll already know how to find it. Mod will informe about distance to the nearest enemy and taking aim at you. All this information is provided by mod in the form of colored arrows. About enemy’s direction you will be inform by green arrow. This means there is no danger and enemy will not be able to aim in you. If the arrow will change its color to red – be careful: the enemy is close (on the arrow will display the distance in meters). But the most dangerous is the purple color. But the most dangerous is purple arrow. It means only one thing: you must immediately run, the enemy saw you and has aims. Agree this information will be very impotant during the battle. Changing the arrow's colour based on where they're aiming isn't information you can take from the minimap. IMO that's where it crosses the line and becomes a cheat. The fog is purely cosmetic, and removing it increases performance on lower grade computers, it gives no advantage, and doesn't effect fair play. To remove fog, is perfectly fine. 1. The direction, type, and distance of the nearest spotted enemy. 2. The direction, type, and distance of spotted enemies that are behind hard cover. 3. The direction, type, and distance of spotted enemies that have line of sight to you (and vice versa). 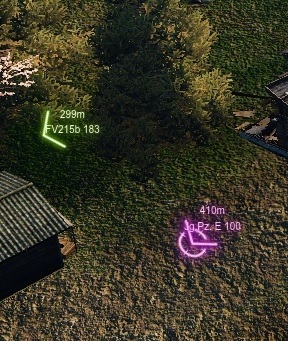 Especially nr 3 is very useful, as you immediately get an indicator to show you tanks that you can actually shoot at, and which can shoot at you. It's supremely useful for people with bad situational awareness. Especially new players, I guess. It's a really marginal mod, which I personally believe should probably not be allowed, as it really gives a big advantage. That said, it doesn't actually tell you anything you can't already see by just looking around. Edited by c0keb0ttle, 11 November 2016 - 09:38 PM. the reason is u don't have an official stance on wat mods r allowed and not allowed . I think its wrong for u to even post that info it shud be done by a member of wg . whats his defence going to be ? oh I read a post that someone made with a list of mods that are forbidden and not forbidden. u see where I am coming from? then that player comes back and blames u for having that list. Edited by bubs79, 12 November 2016 - 12:06 AM. As I said in the OP the red colour is only for those mods/cheats that were clearly specified in the WG criteria of what constitutes a third category mod/cheat. According to those criteria there is no mention of zoom out mods although I agree; those are cheats. But as I said this post isn't just my opinion but a classification of the mods I knew according to the official criteria that WG published las week. Fog removal is a cheat according to the WG criteria. Quoting: "Mods that aid in finding enemies by letting you adjust the transparency of objects on the map". As for tank skins, I consider them cheats too. But again WG didn't put any criteria referring to them in the third category, meaning explicitly forbidden cheats. Live player stats, as for my opinion should be considered as a cheat too. But again WG didn't mention it as an explicitly forbidden cheat. So it is a disputable cheat/mod.